A number of new standards have arrived on the international scene, each promising to affect a large and diverse group of stakeholders -- suppliers, manufacturers, distributors and customers. People involved with quality management systems understand that standards are living documents which constantly evolve. During the last few years, several existing standards and requirements, including ISO 9000 and QS-9000, have undergone changes and revision. A number of new standards also have arrived on the international scene, each promising to affect a large and diverse group of stakeholders--suppliers, manufacturers, distributors and customers. This article offers a status update on the following: AS9000; CE Mark--Medical Device Directive; ISO 9000:2000; ISO/IEC Guide 25; international automotive requirement ISO (TR) 16949; QS-9000, Third Edition; the Tooling and Equipment Supplement, Second Edition; SA8000; and TL 9000. Released in May 1997, AS9000 specifically affects major and minor manufacturing customers, service suppliers and regulatory bodies in the aerospace industry. When the U.S. government adopted ISO 9000, it withdrew military quality standards MIL-Q-9858 and MIL-I-45208. Aerospace suppliers soon found that ISO 9000 didn't address the specific requirements of their customers, including the DoD, NASA, FAA and commercial. Subsequently, aerospace companies including Boeing, Lockheed Martin, Northrop Grumman, GE Aircraft Engines and Pratt & Whitney developed AS9000--based on ISO 9000--to provide a specific quality management standard for the aerospace industry. AS9000, like its parent document ISO 9000, contains 20 elements with identical language; however, industry-specific requirements have been added throughout. The standard's development marks the first attempt to harmonize the requirements of NASA, DoD and FAA while also addressing the industry's business needs. The CE Mark defines the rules manufacturers must follow in producing certain products for sale in the European Union. The Medical Device Directive--consisting of 23 articles, 12 annexes and 18 classification rules--harmonizes and defines requirements for clinically testing, designing, manufacturing, testing/inspecting, marketing, installing and servicing medical devices sold in the EU. The MDD began its phase-in period Jan. 1, 1995; as of June 1, 1998, all medical devices sold in the EU must conform to the directive. Scope changes--elimination of ISO 9002 and ISO 9003. Additional customer satisfaction requirements--including new subclauses 5.2. Customer Needs and Requirements, 7.2. Customer-Related Processes and 8.2.1.1. Measurement of Customer Satisfaction. Formally requiring continuous improvement--Element 8.4.3. Improvement Processes. New focus on management responsibility and resource assurance. ISO/IEC Guide 25, formally titled "General requirements for the competence of testing and calibration laboratories," outlines the general requirements a laboratory must meet to be recognized as competent to carry out tests and calibrations, including sampling. Last revised in 1990, ISO/IEC Guide 25 has since been adopted as a national standard by many countries. It is intended to facilitate harmonization of standards and procedures between laboratories and other bodies. The ISO/CASCO (Committee on conformity assessment) has resolved to revise the guide as an international standard. The guide will then be known under its new name, ISO/IEC 17025. The Draft International Standard was circulated in July 1998, and the DIS inquiry closed in early December 1998. The revised standard is expected to be published by the end of 1999 or early in 2000. The Big Three U.S. automakers have developed this new automotive requirement in cooperation with European automakers. ISO (TR) 16949, Quality systems--Automotive suppliers--Particular requirements for the application of ISO 9001:1994, attempts to harmonize four source documents: QS-9000 (United States), VDA 6.1 (Germany), EAQF (France) and AVQS (Italy). Participating members of ISO and the TC 176 Automotive Task Group voted on the automotive requirement during a three-month period that lasted from August to November 1998. The document is expected to be released in its final form this month. ISO (TR) 16949 does not spell the end of QS-9000; instead, suppliers will have the option to be registered to one of the standards. So far, new registrar qualifications remain undefined. At this time, Asian automakers are not participating, though they have shown interest in eventually being included in the effort. Released in March 1998, QS-9000's latest edition effectively replaced its predecessor on January 1. New features in the document include the IASG's Sanctioned QS-9000 Interpretations; combining "Section II: Sector-Specific Requirements" into the 20 ISO 9000-based elements; numbering automotive additions; the addition of several requirements that were developed from reviews of European automotive quality requirements; and an expanded glossary. Since July 31, 1997, Chrysler Corp. has required all of its production and service part suppliers to be QS-9000-certified. General Motors also required its suppliers to be QS-9000-certified as of Dec. 31, 1997. As of Oct. 1, 1998, Ford Motor Co. required all new suppliers, as well as those on probation, to be third-party registered to QS-9000. Ford currently doesn't require all suppliers to be registered. The Council on Economic Priorities Accreditation Agency released Social Accountability 8000 in October 1997. An advisory board including representatives from CEPAA, Amnesty International, the National Child Labor Committee, Reebok, The Body Shop and other organizations wrote the standard. Based on ISO 9000, SA8000 promotes socially responsible production in manufacturing facilities and workplaces worldwide; it also offers an alternative to the hundreds of internal quality systems developed by organizations to meet quality management needs. The difference between SA8000 and its cousins ISO 9000 and ISO 14000 is that this new document includes performance requirements in addition to system requirements. To qualify for certification, organizations must meet verifiable standards for child labor, forced labor, health and safety, freedom of association, discrimination, disciplinary practices, working hours, compensation and management systems. The standard may be most effective for companies and organizations that have high public profiles and want to demonstrate accountability to their work force, including--but not limited to--toymakers, cosmetics companies and clothing manufacturers. First issued in July 1996 and subsequently updated in June 1998, the TE Supplement outlines the quality system expectations that certain companies, in particular the Big Three-- Chrysler Corp., Ford Motor Co. and General Motors Corp.--hold for their tooling and equipment suppliers. The document is used with QS-9000 as one document for the tooling and equipment industry. Although the TE Supplement is currently an advisory document--which prohibits registrars from registering companies to it--Chrysler will require all of its tooling and equipment suppliers to be third-party registered to the supplement by July 31, 2000. Ford is considering whether to require tooling and equipment suppliers to be registered to the TE Supplement; General Motors currently has no plans to require third-party registration for its TE suppliers. The Quality Excellence for Suppliers of Telecommunications Leadership Forum (QuEST) wrote TL 9000 to consolidate the various and competing quality systems requirements within the telecommunications industry. 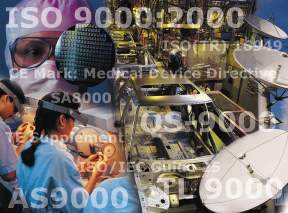 TL 9000 offers a telecommunications-specific set of requirements based on ISO 9001; it defines the quality system requirements for design, development, production, delivery, installation and maintenance of telecommunications products and services. QuEST plans to release the first of two TL 9000 books this month. The first book will cover the common regulations among hardware, software and services. The second book, expected to be released in the third quarter of this year, will discuss common software, hardware and services metrics. The QuEST Forum will be responsible for maintaining the requirements and TL 9000's compatibility with other requirements and standards. Telecommunications service providers, their subscribers and their suppliers receive a number of benefits, including continuous improvement of service to subscribers, enhanced customer/supplier relationships, standardization of quality system requirements worldwide, overall cost reduction and increased competitiveness, and creation of a platform for improvement initiatives. Elizabeth R. Larson is Quality Digest's news editor.